Two philanthropic foundations working for orphans, aged people and HIV patients were provided with cash assistance by a donor yesterday. Myanmar Finance International Limited (MFIL), a microfinance joint venture of AIM listed Myanmar Investments International (MIL), has raised an additional local currency denominated $1 million debt facility from Malaysia’s Maybank. A unit at United Overseas Bank (UOB) that deals with foreign direct investment helped steer more than $27 billion worth of business spending in South-east Asia last year – double the amount recorded in 2015. 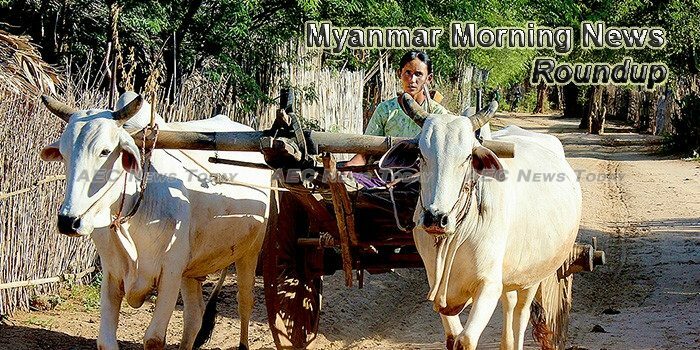 Anglo-Dutch consumer goods giant Unilever (UL) has reportedly inked a joint venture with local rival Europe & Asia Commercial Company (EAC) in Myanmar as it bets on the “fast-opening country.” Despite a decline in both economic growth and the local currency, the consumer producer maker is bullish on the growth opportunity after trade restrictions have been lifted. The Nikkei Myanmar Manufacturing Purchasing Managers’ Index, or PMI, fell marginally to 52.9 in April from March’s 53.1, which was the highest reading since the survey began in December 2015. Myanmar’s plans to grow the country’s desperately needed but polluting coal-fired power plants could kill more than a quarter of a million people in the coming decades, environmentalists said Thursday. China National Petroleum Corp, the country’s largest oil and gas producer, has pumped the first crude oil through the China-Myanmar oil pipeline and the oil is expected to arrive in China within three weeks, the energy giant said on Wednesday. Outdated infrastructure and increased urbanisation are placing a huge burden on water supplies for the commercial capital. NLD heavyweight U Win Htein says the Ministry of Home Affairs is investigating the source of rumours claiming the impending resignation of President U Htin Kyaw, with criminal charges expected for any culprits found during the probe. The former chief minister of central Myanmar’s Magwe region on Thursday returned 3 billion (U.S. $2.2 million) kyats in missing funds to the regional government and said he will transfer nearly 5 billion (U.S. $3.6 million) more this week, a regional government official said. Myanmar authori­ties issued a to­tal of 123 licens­es to companies in the booming telecommuni­cations sector in the past two years, official media reported last week. A private company, South East Asia Energy and Electricity Company, has submitted a proposal to Taninthayi regional government to supply 60 megawatts of electricity generated from hydropower, solar power and fuel oil (FO), with an investment of more than US$60 million in Myeik district, sources said. The Mandalay Region minister for natural resources and environmental conservation said he would permit no more marble mining in the Yakkinsin and Shwesanshin mountains in Pyin Oo Lwin District. The Vatican and Myanmar established full diplomatic relations on Thursday (May 4) in the latest step in the Southeast Asian nation’s rehabilitation by the international community.